Few books get borrowed more often than those that fall under the subjects of Metaphysical, New-Age, and Occult. It's due in part to the lure of the topics, but the nature of seekers often is to share with fellow seekers. 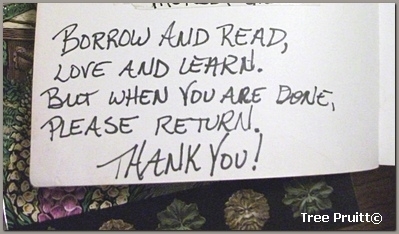 However due to the nature of day to day life those borrowed books, or other media, often don't get returned to the owner. Here I'm sharing my simple little spell to secure the return of a borrowed book. I'll often give this spell an extra boost by writing it directly onto the media. 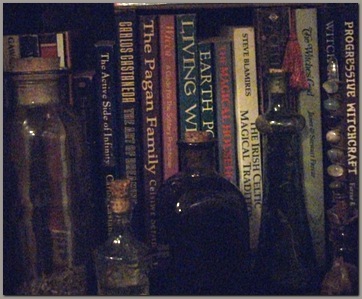 My copy of a book by Scott Cunningham has been lent out more times than I can recall, and I read once that "Wicca: A Guide for the Solitary Practitioner" is the number one book returned least often when borrowed out, but mine with the spell has always returned. Perhaps I can state from empirical evidence that the spell works because my husbands personal copy (from before we were an "us") was not spelled upon, nor was it returned when last borrowed; As a matter of fact, the borrower said that they lent it someone else that also had failed to return it. So I believe that writing the words of the spell directly onto the media will help remind the person borrowing it that it needs to go home when they are done. Verse for a borrowed book. *Best performed on a Sunday or Wednesday near to or at Full Moon if possible. *Can utilize throat and solar plexus chakras by pulling energy in through those locations. Prepare an altar top or other suitable work space. Have your book or other media at the ready. Prepare to burn a small amount of herb. 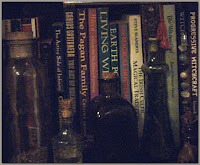 Use one or a combination of the following: Dragon's Blood, Chamomile, Pine, Rowan, Mugwort or a Dragon's Blood incense. Have a pen with non-fading ink or permanent marker if you'll be writing on your item. Have 4 clear quartz crystals, of any size, as energy amplifiers. Have the spell verse that is shown below at the ready. When you're ready to begin light the candle. Set the crystals as a four point square with the points facing inward. Place your media item inside that square. If you intend to do so, this is the point in which you should cast a Sacred Circle and/or invoke the assistance of deities and elementals. Light the herb and blow on it gently until the smoke billows up. While chanting the spell verse pass your media item through the smoke, high above the heat. You can slowly fan-flip the pages of a book or rotate a compact disk; be sure to open disk cases else you could have only the case returned to you minus its CD or DVD partner! In a whispered voice, because whispers use more breath than regular speaking, breath the verse into the spine of a book or onto a disk. Visualise the words of the verse glowing on the surface of your media item; know that you have placed them there forever or until you release the spell. Place the item back inside the crystal space. If you plan on writing the verse physically onto the item this is the time to pick up the pen. Then, because the spell-goal is a matter of objects passing from hand-to-hand I prefer to raise personal energy by briskly rubbing my hands together above the item being spelled. Whisper-chant the verse into your hands. When you feel your energy reaching its peak quickly pull your hands away from eachother while expelling an energized breath at the media item. This breath should be a loud huffed release of your personal energy in a blast, and should make a sound similar to "Ooo-AH!". Then bring your hands together in a loud clap. Add an expression of gratitude to your closing to attract the gratitude of having your item returned: A simple "thank you" will suffice. It is done. It's not placing a spell upon the person borrowing the media from you, but on the item itself. The verse when written on the item acts as a reminder to the borrower, but in the action of the spell it is for the item. It could be re-considered as if the item were talking to you and saying, "I will borrow out my services and participate in the read, the love, and I will help the borrower to learn, but when I'm through with my work I'll return to you". Sometimes, as with all spells, the results can express in unexpected ways. While visiting someone I walked by a bookcase in the hallway and felt a tingle sensation pull my attention to the case. I paused, and my hand went directly to a book that had been borrowed from me two years prior! It had simply been placed on the shelf for tidiness after having been read, but then forgotten about. I hadn't needed the book, so it wasn't on the forefront of my mind either. The spell had waited for the right time for its expression. Soon thereafter I did have a need to reference that particular book (this, of course, was prior to the search engine age). Thus is my spell to have a borrowed bit of media returned. 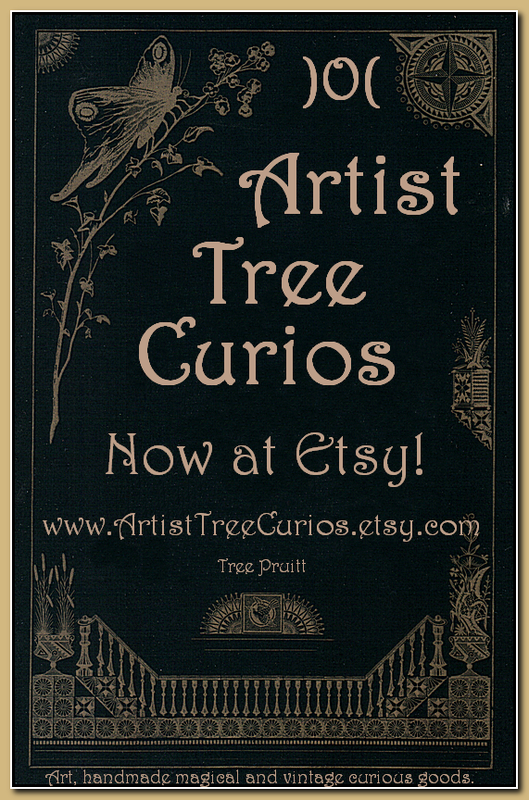 As always, if you use any of the information in this blog do it for free; please don't sell it or charge a fee. Share your results and comments here, and if you do use any of the information provided here do it at your own risk. I can't point to specific references used in the writing of this spell because I wrote it so long ago, but it utilizes basic tables of correspondences; i.e. colors and timing. 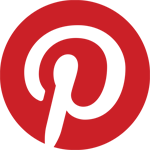 I hope that readers found this post to be helpful, and I thank you for your visit! Being that Imbolc is the earliest of Spring holidays on the Wheel of the Year it's a perfect time for stone purification ritual and crystal cleansing... a little bit of spiritual Spring cleaning! Here in my blog I've shared my Imbolc ritual for cleansing and charging my stones. If you use gemstones in psychic energy work and magick, or simply keep bowls of rocks and crystals to boost the metaphysical energy in your home (feng shui), its good to cleanse them every now and then. Not just washing off physical debris, cleansing the stones removes any accumulated imbalanced or negative energy and most importantly helps to renew your bond with old geo-pals. 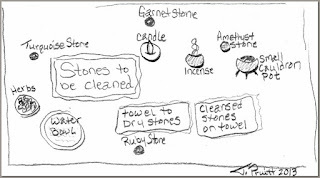 All stones should be "cleared" when newly acquired to remove any imbalanced psychic energy as well as to reset the physical piezoelectric field of crystals, and this is generally done by immersing the stone for one to three days in either sea salt or fresh earth, but once you've cleared a stone a simple cleansing from time to time is all that should be needed. Some stones, such as natural Citrine and Diamonds, are thought to not need psychic cleansing of accumulated energy, yet they will still need to be cleaned of accumulated dust at some point if left sitting in the open. There are many methods for cleansing, but for my Imbolc Sabbat clean I used water and fire. Water is the basic element of Spring cleaning, so using melted snow or freshly captured Winter rain would be ideal. Imbolc is mainly a festival of fire, sympathetic magick intended to call back the warmth of Summer, so I feel that Fire is an excellent choice of elements to use for re-charging my stones at this time of the year. This is a ritual but should be relaxed and less formal than other Imbolc celebrations might be, and this IS a celebration because you should love your stones enough to enjoy and honor them if you'll be working with them in healing or magick. Stones associated with the Imbolc celebration are Amethyst, Bloodstone, Garnet, Ruby, Onyx, Turquoise so they can be used in this ritual in place of colored candles at the Directional Power Points, (North, South, East, West, Spirit/Center), by placing them next to a white tealight candle. The stones may also be used instead of candles if an abundance of flame is a concern to your work space -- don't burn your elbows! Be sure to cleanse those stones you use prior to this ceremony though. Follow your personal traditions for color/direction/element associations. I used... Turquoise to my left for the West , Garnet in front away from me for the North, Amethyst to my right for East, Ruby directly in front of me for the South, and a soft blue candle in the middle for the spiritual Center. The incense I chose was dragon's blood. Cauldron for cleansed stones to rest until finished. Though the cauldron is usually a feminine symbol of the Goddess womb, for Imbolc it represents masculine in the new God born from the womb at Yule and the Dagda, Father of the Gods. I began by gathering all of the stones I intended to clean. I have many in my collection so I will likely do this more than once for Imbolc between January 31st to February 3rd, and so for space I use a large table top rather than a ritual altar. I like laying down dish towels that have images of burning candles on them such as those marketed for the Christmas holiday because the bright festive look is perfect for Imbolc. After gathering the needed supplies I begin entering a ritual frame of mind; You can do this by using your favorite method of choice. I set up my working space by laying the Directional Power Point stones and invoking the Elements. I then lit my Center candle with invocations to the God and Goddess. My water bowl was placed off to the left in an easy to reach position. I sprinkled a pinch of my herbal Ritual Cleansing Brew onto the water, stirring in clockwise with the fingertip of my projection hand to charge the water for cleansing. I lit the incense to my right, in the East/Air position. The stones to be cleansed are lain in the North position, in front of me. A small cauldron pot waited off to my right side. 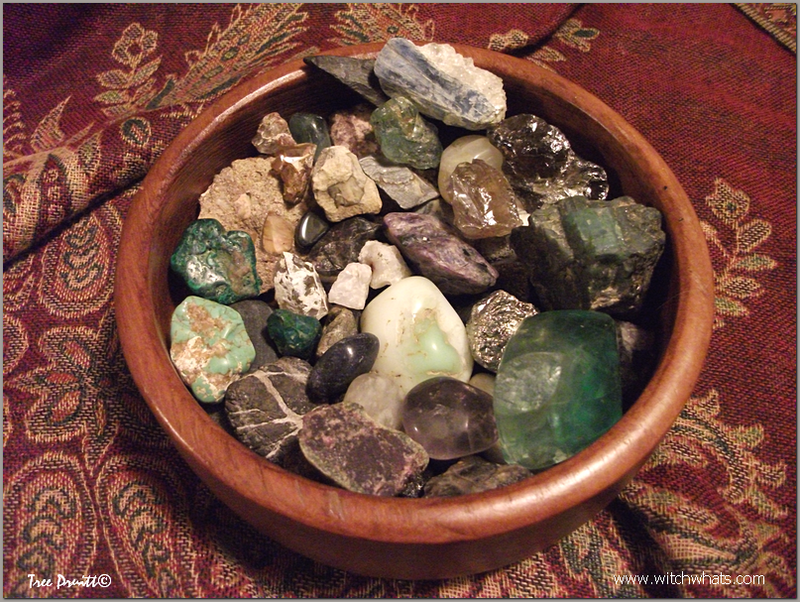 To begin cleansing I chose several stones at a time and set them into the water bowl. Then I removed them one at a time. As a stone is pulled out of the water I swirled it counter-clockwise three times visualising it clean and rubbing any unwanted energy away. Then I rubbed the stone dry, while still visualising cleansing. As I'm doing this I mentally said hello to the stone and spent a little time thinking about it's purpose with me; what it's used for and it's attributes. I also admire any physical traits I enjoy about the way the stone looks because that will further send it positive energy. You might have a favorite chant or Imbolc prayer to recite while doing this. Once reasonably dry each stone was held up in front of the candle flame allowing the light to shine on the surface of the stone to better see its natural beauty. In front of the flame I asked the Goddess Brigid to bless the stone, then set it on the other towel to finish drying before moving on to the next. That in Your service it may be! Let light illuminate the darkness! By the time I reached the last stone in the water the first one set to dry is finished so I return to it, resting off to the side on a towel. Now is the point of rebirth after cleansing. One by one the stones were placed into the cauldron, a symbol of rebirth. The Dagda was the Father of the Goddess Brigid and had a magic cauldron known for great abundance. Here the stones receive blessing from the God for their good service to human needs. When I was finished the cauldron filled to the brim, abundant with stones loving each other. That in Your service it may be. Let its energy be renewed! To finish out my ritual I picked up the Directional Power Point stones, thanking the respective Elements in closing. I used the flame of my larger blue candle to light the white tealight, which was then allowed to burn out. I thanked the Gods for Their presence and extinguished the blue candle. Clean up is the final portion of the ritual. The Directional Power Point stones and blue candle were placed on my household Imbolc altar. The water was poured outside into the Earth, the bowl cleaned and put away. I replaced the stones to their regular display storage areas. I treated this action with an air of celebration sort of like a reverse Easter egg hunt. Have fun at the work if you do this! Enjoy your stones and they will enjoy working with you. The above ritual could easily be adapted to other Sabbats and the petitions used with items other than stones. Thank you for visiting my blog, and please do let me know if you adapt my ritual because I'd love to share in your experience too! "Cunningham's Encyclopedia of Crystal, Gem & Metal Magic", copyright Scott Cunningham 1988, Llewellyn's Sourcebook Series 1997. "Life Forces: A Contemporary Guide to the Cult and Occult", copyright Louis Stewart 1980, Andrews & McMeel. "Meaning of the Cauldron in Myth, Modern Neo-paganism, and Wicca", copyright T. Pruitt. "Petition of Blessing from Brigid for an Object" and "Petition of Blessing from The Dagda for an Object", copyright T. Pruitt 2013. I enjoyed this website, which here offers some guidelines for selecting, clearing, and maintenance of crystals for psychic energy work or magick... "The Care and Feeding of Crystals". 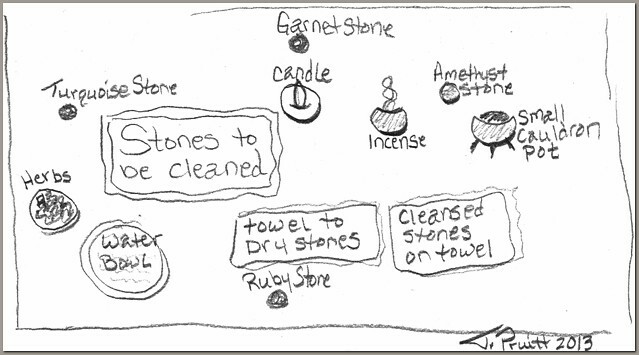 A nice Internet resource page... "Clearing and Cleansing Gemstones and Crystals". "Cleansing Your Crystals with Other Stones". And then the other side of the stone... "To Cleanse or Not to Cleanse". "The Season of Imbolc: Ideas for Honouring the Season of Imbolc"